What started as a tax in 1791 led to the Western Insurrection, or better known as the Whiskey Rebellion of 1794, when protesters used violence and intimidation to prevent federal officials from collecting. The excise tax, passed in 1791 on all distilled spirits, was based on the capacity of the still rather than the quantity of production. In addition, it was required to be paid in cash, which at the time was unusual since whiskey was often used by those in western Pennsylvania to pay for goods and services. The tax was also uneven in the way it was collected between small and large producers. Smaller still operations were required to pay the tax throughout the year at about nine cents per gallon. Larger producers in the east, who benefited from cheaper transportation costs, could decrease their tax by increasing their volume and were allowed to make annual payments that amounted to six cents per gallon. The violence continued to escalate over the next several years and spread to other counties until it came to a head in the summer of 1794. That May, subpoenas were issued for over 60 distillers who had not paid the tax. Those served with the subpoenas were, under the law, obligated to travel to Philadelphia to appear in federal court, which was a burden to those on the western frontier and beyond many of their means. So in June Congress modified the law so that they could appear in local state courts, but by that time U.S. Marshall David Lenox, under Alexander Hamilton’s direction, was already serving writs saying they had to come to Philadelphia. 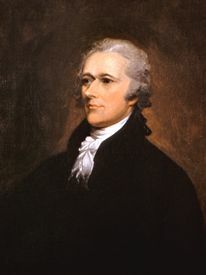 Over the years, historians have argued that Hamilton intentionally did not wait for the change in the law to serve the writs in order to provoke violence that would justify federal military intervention. Others have called it a string of ironic coincidences. Regardless, by mid-July Federal Marshal Lenox had served most of the writs without incident. However, on July 15, Lenox and Federal Tax inspector General John Neville were fired upon at the farm of Oliver Miller, about 10 miles south of Pittsburg. The men split up with Lenox retreating to Pittsburgh and Neville returning home to Bower Hill. 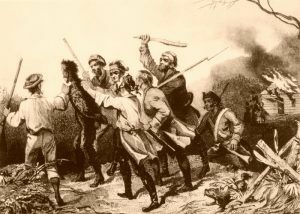 That next day around 30 Mingo creek militiamen showed up at Bower Hill demanding the surrender of Lenox, who wasn’t there. Neville responded by firing a shot from his fortified home, mortally wounding Oliver Miller. The rebels then retreated to Couch’s Fort for reinforcements. By the time they returned the next day they had 600 men and were now commanded by Major James McFarlane, a revolutionary war veteran. Neville also had some reinforcements with 10 U.S. soldiers from Pittsburgh under the command of Major Abraham Kirkpatrick, whom before the rebels arrived had Neville leave the house to a nearby ravine. In the meantime, Lenox and Neville’s son returned the area but were captured by rebels. Historians say it is unclear how many casualties resulted, but after failed negotiations between the rebels and Kirkpatrick shots were fired, and after an hour rebel leader McFarlane called for a cease-fire. As he stepped into the open a shot from the house killed him, which enraged the rebels who then set fire to the house, forcing Kirkpatrick to surrender. Kirkpatrick, along with Lenox and Neville’s son Presley, were kept as prisoners but later escaped.